Cities are a compound of static and fluid layers whose stratification reveals their historical, political and cultural intricacies. The arts are part of these urban strata that regulates individuals, groups and institutions within the constructed hierarchies and categories that simultaneously empower and disempower certain forms of production and performance. The increasing number of artists developing participatory interventions in the urban landscape indicates an interest in exploring emerging interactions with the immediate context. The notion of play appears as key to explain the nature of these interventions since many of them are based on basic gaming rules that, at the same time, question the boundaries and possibilities of theatricality. Traditionally the notion of play has been related to the field of theatre studies and consequently, to the theatrical paradigm. Researchers and theorists such as Victor Turner, Erving Goffman or Roger Caillois applied the notion of play and other dramatic elements to the analysis of social life. The appearance of the performative paradigm as an alternative approach to understand the complexities of the social arena and to describe the emergence of artistic practices that produced new nuances to the boundaries of play was assumed as a liberation and promising change. In this regard, the performative paradigm offered novel insights to budding phenomena―especially since the 90s―such as the use of media and the virtualization of relations, the production of instrumental, fragmented and hybrid forms of languages and the occupation of new spaces for cultural production and representation. Since then, cutting-edge theories and art forms have been proposing practices that seem to question and intercede in the power relations established and generated by capitalism within the democratic systems. Although different artistic manifestations have been playing to subvert the rules or trigger new social playgrounds, the fact is that ›immunitas has been revealed as an implicit backbone of neoliberal capitalism‹ (Vujanovic, 2012). Thus, it seems that the attempts to provoke social change are rapidly aborted as capitalism appears as actually immune to them. However the impact of these kinds of practices is difficult to test; on the one hand it would be an error to assume that participatory practices have always the aim to disrupt the power structures, while on the other hand, their performance have an impact that is affected by all sorts of variables that cannot be anticipated or predicted. However, urban landscapes are currently inhabited by interventions that are certainly altering their stratum―using diverse grades of visibility and interaction these practices play within the frames of paidia and ludus. According to Roger Caillois (1958) paidia represents the wild, free-form, improvisational play while ludus represents the rule-bound, regulated, formalized play. An unlimited source of possibilities can be envisioned through the in-between blurred space that emerges within this dichotomoy. Artists coming from different backgrounds, traditions and contexts have noticed that by playing they can interfere in the urban rituals an habits but they can also discuss and elucidate its implications. In other words, these diverse forms of play not only generate playgrounds within the everyday life (social theatricality) but also question the notion itself and its political implications (perfomativity). In this regard, I would like to ponder the notion of play through three examples that reflect upon about the use and transformation of the public space by generating subtle interventions that emerge as open and unexpected urban encounters rather than organized and scheduled performances. At the same time, these three projects have in common the use of the mobile phone; in these three projects the phone becomes key to have access, enjoy or interact with the artwork. Finnish artist Pilvi Takala often uses the everyday as a ready-made fruitful space to engage with. In her project ›Lost Pigeons‹, developed in the city of Ghent, she collaborated with the local community of pigeon fanciers. In the pigeon sport while top racing pigeons are auctioned for high prices, many others get lost in the racing. Thus, during the racing season in 2012, Takala collected information on the bird fanciers in order to make posters announce each lost pigeon. The posters connected to a sound piece, a phone conversation between the artist and a fancier, offering insight into the economy of the pigeon sport. The piece interacts with the everyday visually―by displaying the posters throughout the city―and even economically and socially. Thanks to the piece lost pigeons have a story and a new value attached to it. The piece gives visibility to the reality and mechanisms of a sport that might pass unnoticed within the social choreographies of the urban landscape as pigeons are present in most cities. ›Lost pigeons‹ plays with the subtle events that conform the city while proposing playful manner to interact; as an invitation that already evokes what is missing, it offers the possibility to get to know what has been lost. Hello Lamp Post is a project by the UK collective PAN developed in Bristol where citizens have the opportunity to establish a dialogue with the urban objects that are part of their daily life. 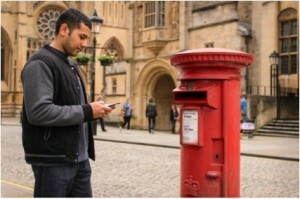 As described by the collective, ›Hello Lamp Post is a playful SMS platform, inviting people to strike up conversations with familiar street furniture using the text message function on their mobile phones.‹ Although it cannot be considered strictly a game, the experience is set up to generate stories and dramaturgies in a playful manner. It is interesting to observe that there was no official database of objects since the players would address a particular street object by including its reference code in a message to Hello Lamp Post phone number. In this case, the players here have a more active role, as they clearly generate content and are also partly responsible of the dynamics of it. Although the creators of Hello Lamp Post were interested in exploring the idea of memory, location and urban experience, the fact is that the project also recalls the Actor-Network-Theory by giving agency to human and non-human actors. The project intervenes in the urban space by establishing new relationships and by prompting an intergenerational stratum that reconnects the past, present and future of the city and establishes a flow of networks and dialogues that question the notion of play in relation to our routines and memorable city spots. The third example entitled ›Mobile Views‹ appears as an artwork and an innovative curatorial practice. ›Mobile Views‹ is a video exhibition designed for Smartphones that can be accessed through the QR codes placed throughout the city of Barcelona. The video pieces have been created by local video-makers that have used the city itself as inspiration. By using QR codes and mobile devices, the city becomes a public display that brings the most contemporary creation to its citizens. The citizens can enjoy the pieces when and where they want. It is interesting to observe how this project plays with the notion of museum and gallery by knocking down their walls and by expanding its limits to the city. QR codes might be traced or unexpectedly discovered triggering several queries around the notion of visitor, space and cultural consumerism. These three examples might serve to address emerging concerns regarding the notion of play. To start with, they are willing to intervene in the stratum and the dynamics of the city by generating actions that create or disrupt specific habits or routines using the mobile phone as a common tool. In this case, the mobile not only serves to locate and reach individuals, places or objects but also displaces and delinks them by proposing alternative uses. In other words, we can argue that technologies serve to battle the established ›geopolitics of knowledge‹ (Mignolo 2002) originated through the politics of control and social and cultural organization that lie beneath the urban system. Thus, these three playful actions produce new social relations through a dynamics that is non-instrumental, active, unexpected and risky. Quentin Stevens gives evidence of the ludic potentials of these actions in his book The Ludic City (2007) by arguing how playing often erases physical constraints and social etiquette and thus the assumed notions are attached to the city dynamics. However, play is not only a product of possibility but also a driver. Hence, ›playful acts are within that part of the social oeuvre where people step beyond instrumentality, compulsion, convention, safety and predictability to pursue new and unexpected prospects‹ (Stevens, 196). According to these examples, the unforeseen is also related to the symbolic, common, forgotten or hidden―lost pingeons, daily urban objects and hidden exhibitions inhabiting the streets. It seems that the undefined categories that appear in the blurred margins of paidia and ludus perform a permanent state of emergence characterized by a dialogical subtle contestation that interrogates our representations of space and the sense of a ›we‹ that recalls Jean Luc Nancy’s community. Through these three artistic invitations a sense of personal and local history pervades and reminds us that beyond its functional and productive goals, cities are playful and can be played. The growing interest in experimenting with forms of play might be regarded as a way to question contemporary values. However, the emergence of participatory practices and the spreading culture of gaming have been also considered as strategies to reinforce and promote alienating forms of leisure and production. In Homo Ludens, the groundbreaking 1938 study on the importance of play in human culture, Dutch historian Johan Huizinga already pointed a tendency in the corruption of the values of play as well as a danger for play to be institutionalized in the structures of society. The implications of play pose many questions in relation to micropolitics, urban cartography and representation and the aim of art in terms of social intervention and authorship. From my perspective, the value of these three site-specific interventions lie in their engagement to a specific urban context; this engagement has both performative and theatrical effects in the urban palimpsest since these actions modify the organization, relationships and aesthetics of the city. Beyond the artists’ motivation, the effects of playing trigger a latent sense of liveness that might denote that the public space has not been yet fully regulated and controlled and thus the possibility of engaging with alternative modes of coexistence. In other words, play is based in creating ›forces of encounter‹ (Seigworth and Gregg, 2010) and those are the ones that define our affects and our capacity to understand and intervene in the social arena. In this regard, play as a rich concept and fruitful practice should not be devaluated by biased and profit-oriented uses albeit it currently raises all sorts of suspicions. On the contrary, play as such appears as a fluid and unforeseen term whose possibilities and limits have not been fully discovered yet since it generates ›experiencies of non-knowledge‹ (Bataille, 1952) that free us from traditional forms of envisioning and understanding life in the urban space. Seighworth, G. and M. Gregg, 2010. The Affect Theory Reader. Pennsylvania: Duke University Press. Stevens, Q., 2007. The Ludic City. London and New York: Routlege.